Well hello again and here we are on the downhill to opening the first door on the advent calendar! As I can now officially say Christmas isn’t that far away, it seems like the perfect time to talk about 2015 and all of the trends for wedding dresses you can look forward to next year. Back To Backs – oh yes, the statement back is going to be big news and I love this trend. It has incredible ‘wow’ factor and as you glide up the aisle, no one can fail to notice you and your gorgeous gown. Whether you go for a barely-there back with large cut-away sections, or an illusion back with beading and embellishments set over a fine net, you just can’t go wrong. 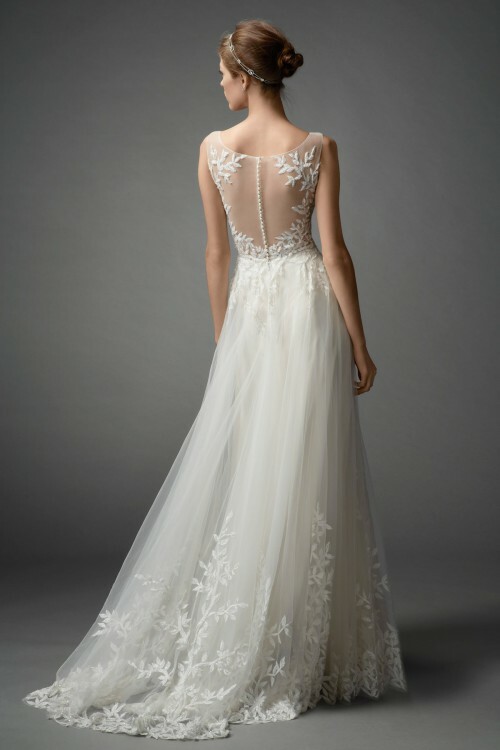 Lots of the gowns here at Coco & Kate are bang on the ‘back to backs’ trend. Our new designer, Love Marley features some amazing back detail, as do ‘Joy’ and ‘Rye’ from Maria Senvo. I am also super excited to have the new gowns from Watters and Hayley Paige (both coming Spring 2015) and these designs will knock your socks off. Form an orderly queue now ladies! Perfect Coverage – strapless gowns are definitely not the bridal essential that they once were and now, the first thing lots of brides say when they visit us for their appointment is ‘no strapless gowns’! Happily, the covered up trend is going to be big in 2015 so fear not, over-exposure is not going to be an issue at all. We don’t have many strapless gowns at Coco & Kate at all (and the ones we do have are elegant, classic and well designed) Instead, we’ve got lots of wedding gowns with cap sleeves, long sleeves, fine lace sleeves and many more beautiful alternatives. Capes and other cover-ups are also big news and we can help you with these finishing touches at your styling appointments. Making an addition or two to your gown makes it pop with personality and we love this! So, I’m sure that little run-down of the wedding gown goodness that’s in store for 2015 has made you smile. If you want to be among the first to try on these new designs, get in touch today to make your appointment and we can indulge our love of design perfection together.